“You should build a telescope”, said the gentleman from the Vivekananda Monastery in Ganges, MI. 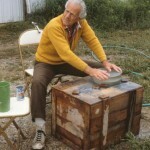 The year was 1990, the place was Fennville HS, and the person leading the telescope building workshop was John Dobson. So that summer, with my school’s support, I spent five days constructing a 10-inch dobsonian telescope. 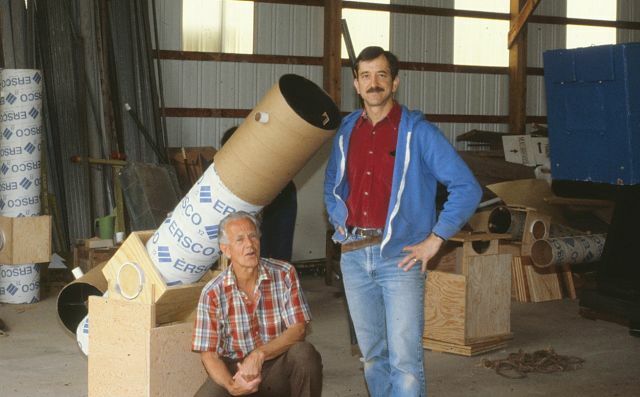 I knew at the time that building a telescope with John Dobson, (the dobsonian telescope is his namesake), would be like constructing a violin with Antonio Stradivari, but I was not prepared for what was to follow. Dobson was a genius but his skills as an instructor were, shall we say, unique. There were about a half dozen participants in the workshop and he had no patience for slackers or whiners and he did not mince words. His style of pointing out and correcting our mistakes was sometimes described as scolding, and one or two folks left after only a couple of days. But the rest of us took his comments in stride and soon learned to gain his respect and support through hard work and adherence to instructions. 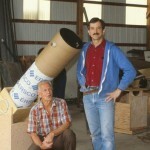 We built our telescopes out of cardboard tubing. plywood, PVC, and common items such as LPs and carpet scraps. We ground the mirrors and constructed the boxes all by hand. In fact, we probably spent four out of the five days on the mirror. My mirror blank was a circular piece of glass two inches thick and ten inches in diameter. The grinding process involves simply rubbing two pieces of glass together (the mirror blank on top of the “tool”) and with water and fine sand or “grit” one becomes concave and the other convex. Of course, “simply” doesn’t count the fact that the blank weighed over ten pounds and I did it for about twenty five hours. I remember after one day of grinding one of my pinkies was completely numb. During this process the curvature of the glass is closely tested and measured since that is a critical factor in the mirror’s final quality. The last fine step is called “figuring” or fine-tuning the curve. I remember being delayed the last morning and when I arrived, John had figured my mirror himself. I always felt that this was a tremendous complement because he NEVER did any of our work for us and rarely gave verbal praise. So when he did the most critical step himself, I felt pretty good. 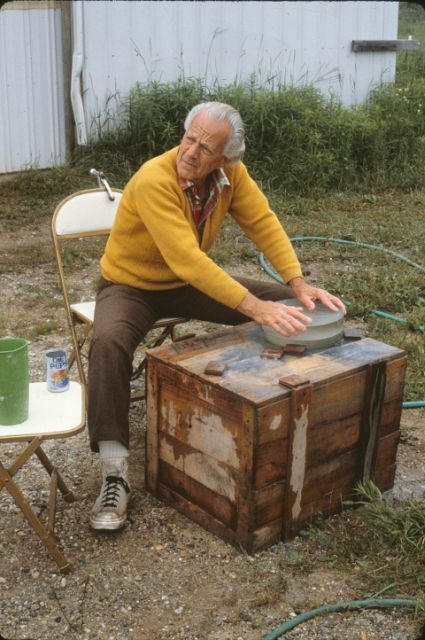 John was a man of simple means who devoted his life to amateur astronomy, introducing tens of thousands of people to the wonders of the night sky. During his time in West Michigan he spoke at my school and the local astronomy club as well as doing public observing and telescope making at Vivekananda. John Dobson died January 15. He will be greatly missed and fondly remembered by those who enjoy looking up in the sky.